Durham ARC had three entries in the 2018 British Rowing Sculling Festival which took place in sometimes challenging conditions at Nottingham over the weekend of August 18th and 19th. The festival is a fun and competitive event that challenges a sculler’s technical skills, manoeuvrability and competency, and is run as an omnium with points from individual events contributing towards the overall rankings. Side by side races took place on Sunday, with scullers being placed in finals A to F according to their time trial performance. The schedule was revised and races shortened to 500 metres because of the conditions. Hope was the best placed from DARC, coming 4th in the A final in a time of 1.50.9, Rachael was 4th in the E final and Grace 4th in the F final. Race results are availabe here. For full results listings in each category see U23 and J18. This entry was posted in Event News on August 20, 2018 by Colin Lawson. For the past 3 years Tees Rowing Club’s recreational rowers (or WRecks as they like to be called) have invited members of Durham ARC to join them for a row on the River Tees to Yarm and back, a fixture which is gaining in popularity each year. Given the fine condtions this summer it’s not difficult to see why touring is such an enjoyable experience. Exchange visits between the recreational rowers from Tees and DARC started 6 years ago following the introduction by British Rowing of the Explore Rowing movement and then the Explore Series, and the relationship has since flourished to include the wider masters squad as well as members of other clubs who row during the daytime. Coordinated by Len Small from Tees the day is also a social occasion with rowers returning to a BBQ lunch prepared by the Tees members. This year in addition to the 74 taking part in the 25km return trip from the River Tees Watersports Centre to the railway viaduct at Yarm, numbers were swelled by launch drivers, volunteers and supporters, with over 100 attending the BBQ. In previous years Tees have been able to offer their own boats for use by visitors, thus avoiding the need for trailering, but with Increased interest from their own members this year visitors were recommended to bring their own boats, a move that has generated interest from those who like to use more familiar equipment. Seventeen rowers from DARC and four from Hexham therefore arrived at Stockton on Tuesday August 7th, with five boats from Durham and one from Hexham, ready to set off, and after a safety briefing the tour got underway at 9.30am. The DARC contingent included George and Helen Adair, Heather Hirst and Nicola Field in a coxless quad, Kalpana Ganatra, Alison Shepherd, Gene Dobson, Paddy Deans and Caroline Scholl in a coxed quad, and Dave Green, Colin Lawson, Vaughan Gordon, Linda James and Elizabeth Bostock in a second coxed quad. Andrew and Christine Fisk followed in a double with Peter Fisk in a single scull. All completed the tour safely after taking turns to land at the pontoon at Yarm School for a short break at the halfway point, arriving back at the River Tees Watersports Centre to enjoy the lunch and post event company. We look forward to continuing to enhance the status of rowing tours and challenges in future, following the cancellation of this year’s Great Tyne Row and a fall in the number of entries for the River Wear Tour. Tours are increasing in popularity in other regions with the first Explore the Broads tour, attended by Paddy, taking place in Norfolk and Suffolk in June and the 25th anniversary British Rowing Tour on the Upper Thames due to set off at the end of August. This entry was posted in Event News on August 8, 2018 by Colin Lawson. With competition from the World Cup final and Wimbledon to contend with as well as 25-degree temperatures 14 teams ventured forth for this year’s Allcomers Regatta, a fun event for crews new to rowing. A prompt start at 11am enabled the scheduled 26 races over a 400-metre course to be completed by 3.30pm and medals presented to winners and runners-up in the men’s, women’s and mixed divisions just in time for the 4pm kick-off between France and Croatia which was shown in the bar, rounding off a very enjoyable day for competitors, volunteers and spectators. Winning their 3 races It’ll be Oar Right when we Finish narrowly held off Blazin’ Paddles VI in their final race to win the men’s competition, while Red Hot Rowers were the women’s winners with 4 wins, with GCSE Music runners-up with 3. In the mixed category The Funny Bones took the honours, holding off Usain Boat in the final race of the day to take a maximum 4 points while Absolutely Oarsome took second place with 3. For those wishing to hone their new found skills the club is running Learn to Row courses starting on Tuesday July 17th at 10am, Friday 27th at 6.30pm and Sunday 29th at 4pm. Details are on the Explore Rowing page. We also offer Adult Sunday sessions at a cost of £5 per session for non-members. This entry was posted in Event News on July 15, 2018 by Colin Lawson. Our next event is the Allcomers Regatta on Sunday 15th July. To date we have 14 entries but can still take more. Crews will require coaches, so if anyone is willing to take on a crew to coach please let us know. It promises to be an exciting day. It is also a great opportunity to raise funds for the club. We would like to run a raffle and auction at the Allcomers Regatta as this has been very successful in the past, so please also get in touch if you are able to provide a raffle prize. Auction / raffle prizes could be items, experiences or promises. Examples from the past have been a break in a members holiday cottage, golf lesson with a pro, driving lessons, spa day etc. If you have a business or a business contact or would be willing to donate something please let us know via allcomers@durham-arc.org.uk. Entry forms, poster and details of how to enter are on the Allcomers page. The closing date is July 4th. This entry was posted in Event News on June 20, 2018 by Colin Lawson. An entry of over 450 meant a busy weekend for the Club at Durham City Regatta on May 12th and 13th. Conditions were ideal and a healthy turnout of spectators drawn by the Spring sunshine was able to witness some exciting racing. Durham ARC had an excellent return of 17 wins from 59 entries, with 10 on Saturday and 7 on Sunday, ranging in age from WJ13 to Masters G and covering every boat size. As well as a strong contingent from the host club and schools and clubs across the northern region there was the usual fierce competition between the Durham colleges, with Collingwood College winning both the senior eight and senior coxed four, and also good representation from Yorkshire clubs with Doncaster, York and Bradford to the fore. The J13 girls (Libby Morris, Tilly Stoddard, Violet Elliiott, Alice Chilvers + cox Francesca Suggett) won their coxed quad on Saturday and then Libby Morris and Tilly Stoddard also won the WJ13 double on Sunday. The J15 boys double and J14 girls double both won on Sunday, while the J18 boys double won on Saturday. The Masters squad had a successful time with Andy Jaggard winning the MasG single on both days, and the WMasE coxless quad of Nicola Field, Linda Forwood, Vickie Jackson and Julie Kitson winning on both days. There were more wins for the Masters Women on Saturday in single sculls with Kim Forster winning at WMasC and Joyce Collett at WMasF. The MasD 8+ won on Saturday and another Masters G win went to John Appleby and Micky Stevens in the double sculls. There was a first regatta win for the WMasF quad of Alison Shepherd, Sue Lyons, Jane Auster and Kalpana Ganatra, with John Lyons winning his first medal as a cox. Another Sunday win went to Rob Coe and Martyn Calkin in the MasD double. The Senior men’s Intermediate coxless quad of Joe Owen, Nick Spong, Nicholas Baird and David Rutter won on Saturday, as did the Intermediate double of Nicholas Baird and David Rutter. The performance across the board bodes well for the coming season as crews prepare for Tees, Wansbeck and Hexham Regattas in the coming weeks before focusing on Durham Regatta on June 9th and 10th. All the results from Saturday and Sunday are available. Also see website for latest list of results. This entry was posted in Event News, Racing News on May 14, 2018 by Colin Lawson. Sunday July 15th has been set as the date for the 2018 Durham City Allcomers Regatta, an event for those who haven’t rowed before, and crews are needed! Entries are invited for our annual fun regatta, racing in stable coxed fours over a short course on the River Wear. All you need to do is gather together 4 people to form a crew. Entry is £80 per crew. Cox and coach will be provided by the club, as will all equipment, including a boat! Entries close on Wednesday July 4th. Further details can be found on the Allcomers page and on the flyer, so ask your friends to form a crew. Entry forms will be available soon so start planning now. Enquiries by email to allcomers@durham-arc.org.uk or telephone 0191 3866431. This entry was posted in Event News on May 1, 2018 by Colin Lawson. Seventeen teams took part in Durham ARC’s Allcomers Regatta on September 24th, the best entry for several years. Numbers were boosted by 3 teams who had travelled from Whitby for the occasion. Five men’s teams, five mixed and 7 women’s teams contested a total of 34 races over a 300 metre course on a round robin basis. The crews from Whitby Friendship Rowing Club performed well, winning most of their races, but as they were classed as experienced rowers they were ineligible for prizes even though their experience was of fixed seat rather than sliding seat rowing. Waterboys won the men’s competition, The Square Blades won the mixed competition, and Ladies who Launch took the accolades in the women’s competition, holding off Wannabe Wags in an ergo relay tie breaker. Other attractions were available to entertain a healthy gathering of spectators, including a BBQ and Pimms stall. Winners of the ergo challenge were James Kendrew for men, Annabel Sholey for women and Steven Curtis for juniors. This entry was posted in Event News on September 29, 2017 by Colin Lawson. Three DARC crews took part in the seventh Great Tyne Row on September 2nd 2017, all mixed coxed quads. The event is a 25km row on the River Tyne in stable boats from Newburn to Tynemouth. Thirty-four crews took part in all. Thirteen DARC members were joined by Roger Bean, now of Stourport RC, who had travelled from the Midlands for the occasion, and Victoria Dektereff of Tees RC, to form the 3 crews. 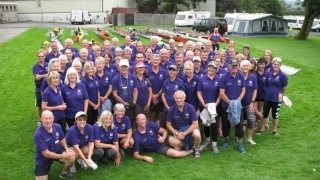 As Roger and Victoria had each recovered from a stroke in the past and all the others in the crews have had family members affected by stroke it was decided to combine the row with some fundraising for the Stroke Association. The Great Tyne Row is arranged by the Northern Rowing Council and attracts entries from around the UK. Because the number of stable boats in the region is limited, arrangements were made to borrow boats from Durham University, and to loan boats to other clubs who wished to take part, hence further complicating the already complex logistics of taking part and getting crews and boats to and from the start and finish. With Tees RC’s trailer booked for a regatta at Hollingworth Lake on the same day, DARC offered to trailer the 2 Tees quads going to the Great Tyne Row, one of which was being loaned to Tynemouth RC, while one of the DARC quads was loaned to Tyne ARC. This meant transporting 6 stable quads, but due to a clash with the World Masters Regatta in Bled DARC didn’t have a trailer capable of carrying that number, or a suitable vehicle to tow it, so it was necessary to borrow these from Durham University. Transport arrangements are always more challenging than the rowing itself. Crews duly arrived at Tyne United RC kitted out by the Stroke Association and with appropriate team names. Stroke’n’Recovery (Elizabeth Judson, Sue Lyons, Roger Bean and Linda James, coxed by Clive Hole) stared in division 4 at 1.30pm, along with The FAST Crew (Vaughan Gordon, Victoria Dektereff and Jane Auster, with Dave Green and Steve Auster sharing coxing duties). Thirty Strokes a Minute (Chris Merchant, Colin Lawson and Nicola Field, with Kalpana Ganatra and Caroline Scholl sharing coxing and stroking) set off 10 minutes later in division 5. The latter two crews changed positions on the water at the halfway point. All arrived safely at the finish line at North Shields before continuing across the harbour to land on the beach at Tynemouth, where another session of trailer loading awaited them before the BBQ and presentation of awards. Fine conditions throughout made it a most enjoyable day. See the Great Tyne Row website for further details including results. The FAST crew and 30 Strokes a Minute finished joint 15th in 2hr 13 mins. Stroke’n’Recovery came 31st in 2hr 51 mins. Tyne United’s open quad was the overall winner in 1hr 47min, with Weybridge and Weyfarers joint winners in the mixed category, and Weybridge also providing the fastest women’s crew. Will Hamlyn of Gateshead CRC won the Harry Clasper Award for being the first competitor ever to complete the event in a coxed single scull, using Gateshead’s Dory, James Renforth, and finishing in 3hr 04 mins. Thanks go to our trailer drivers Mark French and Mark Bell. The event is co-ordinated by a small group of dedicated volunteers from the Northern Rowing Council. If you can help by supporting the event in future there is information about the types of support you might like to consider. In total the DARC crews raised £1567 for the Stroke Association. This entry was posted in Event News on September 4, 2017 by Colin Lawson. 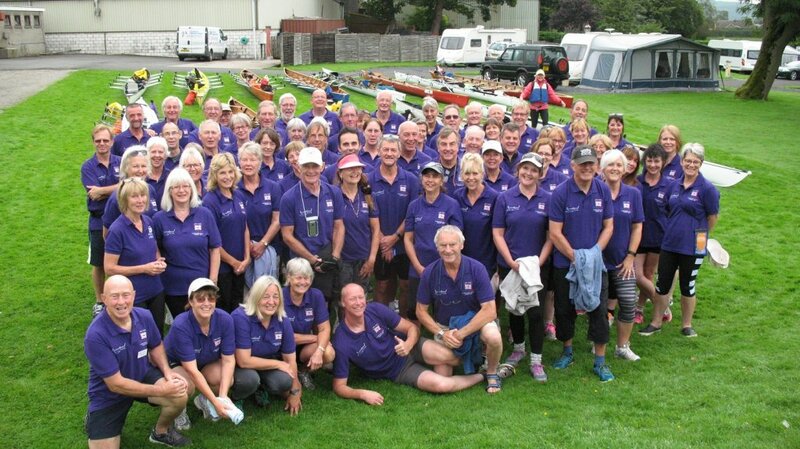 Sixty-five rowers including Colin Lawson from Durham ARC took part in the 24th annual British Rowing UK Tour between August 24th and 27th 2017, thirteen stable coxed quads covering 40 miles of the Lancaster Canal from Preston to Tewitfield in three days. 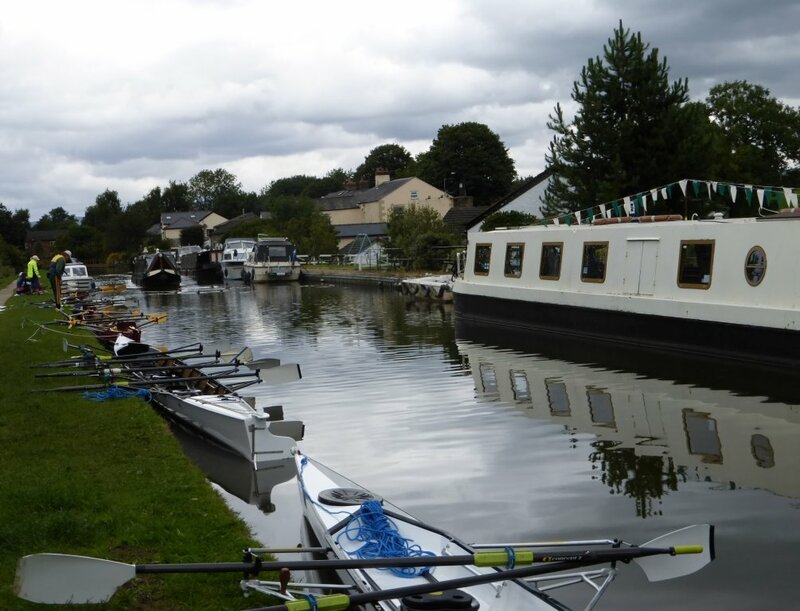 Unlike 2011 when the UK Tour last visited Lancaster, rowers were greeted by dry and predominantly fine conditions with little wind, ideal for touring. The Lancaster Canal was surveyed and constructed during the 1790s by Scottish engineer John Rennie. Being a contour canal, it has no locks, making life simpler for rowers, though it does have 122 bridges along its length, almost all too narrow for passage without shipping oars. Accommodation for the group had been arranged by tour organiser Peter Barker of Upton Rowing Club at the Holiday Inn near the M6 exit for Lancaster, a perfect choice in a quiet setting next to the River Lune, and only yards from where the river is crossed by the Lune Aqueduct, the largest all-masonry aqueduct in Britain. Day 1 on Friday was the longest of the three. A 20-mile coach journey united crews with their boats, coxed touring quads, before the latter were launched on to the canal for the first leg of 14 and a half miles, stopping at Bilsborrow after 9 miles for a packed lunch and visit to Owd Nell’s Tavern, continuing through beautiful scenery and passing numerous moored barges, and reaching Bridge House Marina at Garstang by mid-afternoon. This was to be the overnight stop. A quad from Lancaster John O’Gaunt, recovering from the after effects of Storm Desmond and celebrating its 175th anniversary this year, joined the tour for the final day. After the excitement of the previous evening Sunday was a relatively short 10-mile affair, crossing the aqueduct then enjoying glorious views across Morecambe Bay towards the Lake District mountains beyond, and arriving at the northern extent of the navigation at Tewitfield in time for lunch at the Longlands Hotel, but not before negotiating the tunnel under the M6 motorway – wide enough for barges but not for sculling – so the onboard canoe paddle was brought into play to get through in the dark. Touring is not for the faint hearted! The British Rowing UK Tour is arranged by BR’s Recreational Rowing Committee and has taken place each year since 1994. The 25th anniversary celebration will be a tour on the Thames in August 2018. This entry was posted in Event News on September 3, 2017 by Colin Lawson. On August 23rd twenty members enjoyed a wine tasting evening at the club hosted by Chris Merchant. The convivial social gathering which involved sampling a selection of 6 wines from around the world proved to be a great success. Food was provided in the form of tapas style nibbles while Chris gave an insight into each of the wines to help guests decide on their favourite, with an opportunity to enjoy it later at their leisure. This entry was posted in Event News on August 31, 2017 by Colin Lawson.